Teddy is making one discovery after the other. While Freddy’s perfecting his musical skill. Goldilocks comes across Dasha and Olivia. Having touched their bellies, she announces that Dasha’s going to have a girl and Olivia – a boy. Well. Let’s wait and see. I see this steamboat so closely for the first time. How beautiful it is! In the park, Junior sees Sasha Ivanov. He seems to be be in a bad humour. But Junior doesn’t have any time to chat – he has to take in charge the suspect. A police officer should train a lot. Look who’s here! Alexander Goth! The working day is over and Junior returns home. He’s taken many of the simlanders: Mortimer and Bella, Katty Cat’s grandparents Tony and Bonny, the hermit from Granite Falls… But it’s the first time, we’ve seen him “alive”. 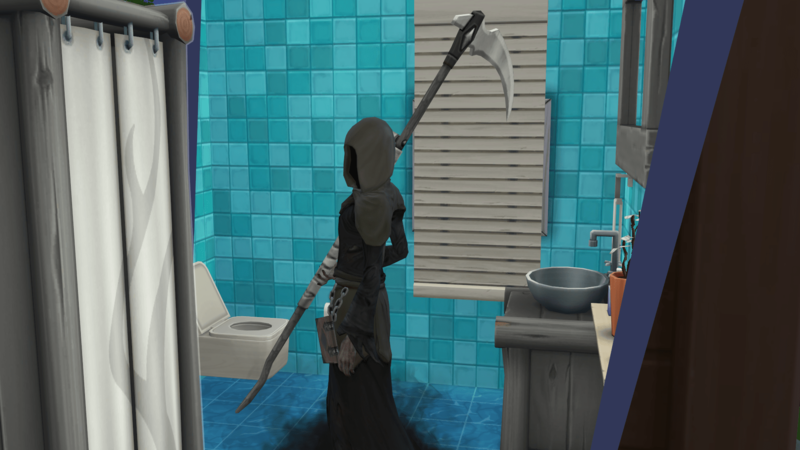 For some reason the Death showed up in the toilet. As if for edification of everyone who likes to block this room, making themselves comfortable with their i-phones and laptops, making no account of those who, drumming desperately on the other side of the door, is performing a ritual dance of Pee-Poo tribe “I-I-I-can’t-hold-out”. But you brought up wonderful children and grandchildren, who love you so much. So you didn’t waste your life. Goldilocks and Junior are weeping. Little Astra didn’t get at first what’s happening and why her grandpa is lying on the floor. Just look at this Death! He’s flirting! Having returned from work, Mommy learnt the sad news. Goldilocks is playing a sad song. Junior is painting a sad picture. Mommy’s feeding the CowPlant. The pet should be fed, no matter how sad you are. Posted on April 22, 2016 by chealsycatPosted in Goldilocks and Bears (Sim fairy tale)Tagged #Goldilocks and Bears, #Sims 4, bears, Goldilocks, Sims.